After morning pickup from selected hotels, travel by comfortable coach to the Meiji Shrine, which was dedicated to the Emperor and Empress in 1926. Hear from your guide why the Meiji Shrine is Tokyo’s most popular and important Shinto shrine while you stroll around the buildings and gardens. Return to the coach and drive past the towering Japanese House of Parliament en route to the Imperial Palace East Garden. Located outside the Imperial Palace on the grounds of a former Edo-era castle, the expansive grounds contain a tea pavilion, traditional Japanese garden, a moat and stone walls. Next, walk along Nakamise Shopping Street, a colorful promenade lined with food stands and souvenir shops that leads up to Tokyo's oldest and most significant Buddhist temple, Asakusa Kannon Temple (also known as Senso-ji). Your guide takes you through the market to tour the magnificent architecture, shrines, and Japanese gardens around the temple. When you finish your meal, board a large boat for a 1-hour cruise around Tokyo Bay. 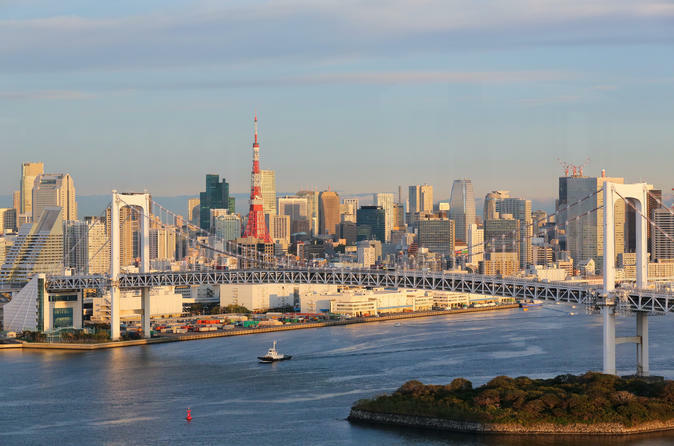 Snap photos of Tokyo’s skyline and iconic sights such as Rainbow Bridge. At the end of your cruise, check out the futuristic waterfront shopping district called Aqua City Odaiba. Keep an eye out for architectural fancies in this area, including the Fuji TC Building, Tokyo Big Sight, and Telecom Center. Your tour ends at Tokyo Station as you make your own way to your hotel. Please note: On Mondays, Fridays and other days when the Imperial Palace East Garden is closed, you will visit Imperial Palace Plaza instead.